Since 2003, several thousand old stringed instruments have passed through the hands of the violin makers at our workshop where instruments are made and restored. Our highly qualified luthiers and violin makers have spent long years of intense work dealing with a variety of different design standards, distinctive physical and acoustic properties, and a wide range of forms of damage. They have a rich wealth of experience which is rare, even when compared to international violin shops. No matter whether your string instrument is historic or contemporary, it is in the best of hands when you bring it to the specialists at our workshop in Munich. Our violin makers will dedicate the same expertise and excellence to your violin, viola, cello and bow which we give to every instrument in our catalogue – a standard which has already won over musicians around the world. Especially when it comes to maintenance and tonal adjustment, our violin makers uphold the highest possible craftsman and aesthetic quality, focusing the breadth of their experience and carefully coordinated services to preserve the value and musical properties of your instrument. With the greatest sensitivity for an instrument’s original condition, we develop convincing solutions in terms of restoring varnish, meticulous touch-ups and re-varnishing, and patching simple and complicated cracks. Corilon's "sound package" for your instrument: we will give the instrument a new bridge and sound post and adjust them with the greatest precision until these central elements of the instrument's acoustic properties have been set up perfectly. Specialised tonal adjustment: over 3,000 instruments in our catalogue have already been set up at our workshop, and this wealth of experience is tangible, even when we are performing routine tasks. Our "Sound package" is available for € 350 (violin) and € 400 (viola). International service: you do not need to come by personally to take advantage of the services our workshop provides. Our experience in shipping valuable stringed instruments ensures rapid and safe transport both within Germany and around the world. Replacement instrument: if you bring us your violin, viola or cello in person, we would be happy to lend you a replacement while your instrument is with us. Premium materials: we exclusively use top-quality materials when repairing your instrument or adjusting its sound. When a restoration to a musically sensitive area is necessary, we take the greatest care in selecting woods with aesthetic and resonant properties that perfectly harmonise with the original substance. 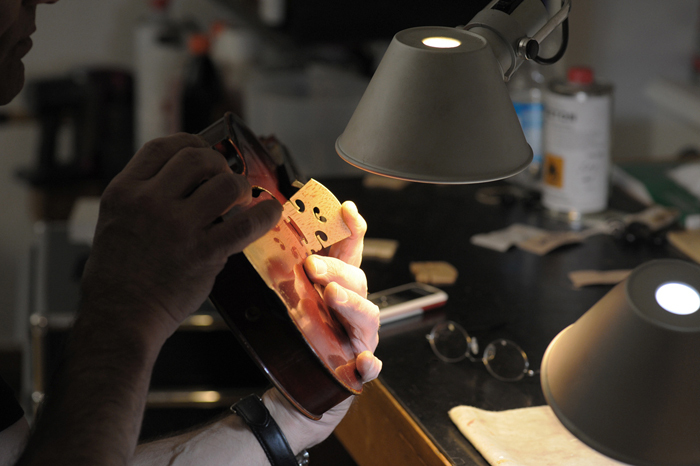 The highest quality standards: our luthiers constantly work on historic master instruments which call for the utmost in craftsman ability; this sets the benchmark at our workshop. Prompt returns: You can rely on us to return your instrument to you promptly at the date we have agreed upon. Every procedure that our luthiers recommend is discussed with you in advance so that you are always aware of the kind of repairs being made and the costs you can anticipate. This applies to repairing the damage that results from accidents or the consequences of improper storage as well as routine maintenance, minor repairs and tonal adjustments. Our experience in internationally shipping delicate string instruments means you can also take advantage of our experts’ services even if you are unable to come to Munich yourself. The core competences at our master violin shop have grown to encompass extensive experience in both restoring valuable old string instruments and in developing nuanced techniques for tonal adjustment. Since we work for sophisticated musicians, the tonal adjustment of each individual violin, viola and cello in our catalog is our utmost priority. The vast numbers of different instruments we have handled since we founded our violin shop in 2003 along with the individual tonal specifications of our clients have helped the team at our master workshop to become the outstanding experts that they are in tonal adjustment, the ultimate discipline in the art of violin making. The services we offer range not only from modeling the delicate resonant properties and making sensitive minor modifications such as adjusting the sound post; we also consult with you about the best technical and physical conditions for your instrument. A professional violin tone optimization is available for € 280 - € 350 (VAT included). When you visit our Munich shop and spend time with our luthiers, you can find inspiration as you try out a customized selection of excellent bows which will unlock the surprising acoustic potential of the instrument you love. Our experience in shipping delicate string instruments internationally also allows you the opportunity to take advantage of professional violin tone optimization or tonal adjustment even if the trip to Munich is too far for you. Munich has long been known as a city of art: luminaries such as Orlando di Lasso worked at the court of Duke Albrecht V during the Renaissance, whereas King Ludwig I transformed the capital of Bavaria into "Athens on the Isar" with his ambitious construction projects. By contrast, however, Munich itself is not widely considered a city of violin making. Despite the great names that line its history, such as Johann Paul Alletsee (1684-1733) and Giuseppe Fiorini (1861-1934), it never achieved the name in violin-making that places such as Füssen or Mittenwald did. Nevertheless, in keeping with Munich's reputation for its unconventional and multi-facetted artistic and cultural life, there were indeed some interesting original thinkers amongst the violin makers who worked in Munich. Johann Kriner (1834-1883), who in turn went on to become the first director of the Mittenwald violin-making school. In his work, Engleder pursued interesting attempts at integrating new contours into stringed instruments. This was a major departure from the classic Italian templates of Stradivari and Guarneri. Engleder experimented with a pear-shaped violin and was inspired by contemporary influences to create pieces such as violins patterned after the body of a guitar. In our time, innovative approaches can be seen in the work of violin maker and physicist Martin Schleske. Much like the famous American researcher Joseph Nagyvary, Martin Schleske has dared the to bridge the gap between craftsmanship and the natural sciences by working with tools such as computer-aided vibration analyses to explore the enigma of a violin's sound. He patented a technique that improves the resonance of violins by using the fungus Xylaria longipes to reduce the density of tonewoods. Innovative minds like Martin Schleske and Nagyvary act as catalysts in a field that is mindful of its traditions and conservative, a craft whose great masters were also great observers and quietly did research on their own. Striking a balance between the work of a laboratory and that of an luthier's atelier can be successful and fruitful, as is evident not only in the highly respectable instruments that these violin-making researchers have created. Other proof of this interdisciplinary approach can be seen is in another context – using dendrochronology to determine the age of wood has become a recognized method in violinmaking history.